Experience—Therminol 66 is the most popular high-temperature, liquid-phase heat transfer fluid in the world. No heat transfer fluid material in the world has a higher degree of customer satisfaction than Therminol 66. Proven Fluid—In a wide variety of applications and thousands of systems around the world, Therminol 66 delivers excellent performance. 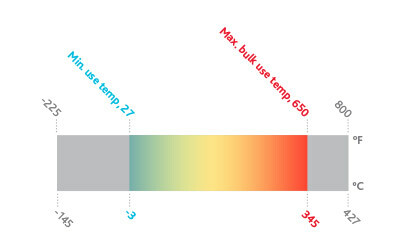 True 650° F (345° C) Performance—Therminol 66 sets the performance standard for high-temperature, liquid-phase fluids. Users can expect many years of reliable, trouble-free operation even when operating continuously at the recommended maximum temperature. Fouling Resistant—Therminol 66 is specifically engineered to resist solids formation and system fouling, providing more reliable operation and potential cost savings.